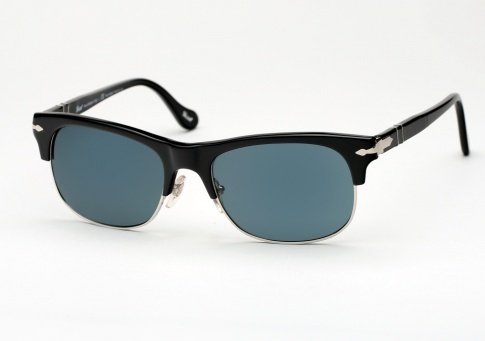 Persol 3034 - Black w/ Blue Polarized Need Help? The Persol 3034 is a classic "clubmaster" design that works on both men and women. It features Persol’s Iconic Supreme Arrow, 5-barrel hinges for strength and durability, and adjustable nose-pads for a finely tuned fit. Handmade in Italy and offered here in black paired with with Persol's premium glass blue polarized photochromic lenses. PHOTOCHROMIC Lenses: Color density gets darker depending on the exposure to UV/sunlight for the sharpest vision possible under various light conditions.